Nicholas Tse saved this film from the pits of suckiness. Now, don't scoff. When his once-promising career was hindered by the numerous scandals he was involved in during the past few years (messy breakups, brush with the law etc. ), the likes of Shawn Yu and Edison Chen managed to flourish in his absence with their undeserving appearances in high-profile HK films, but once Nicholas Tse is at the top of his game, not even Jang Dong-Gun could compete with him in terms of charisma and coolness, let alone those two pretenders. As the preening, flamboyant prettyboy villain in 'The Promise', Nicholas Tse easily stole the show away from the rest of the cast. So impressive he was that the film would feel flat and lifeless during his absence, and one would long for him to appear again just to have him torment our boring protagonists. And that was the core of the problem with 'The Promise'. 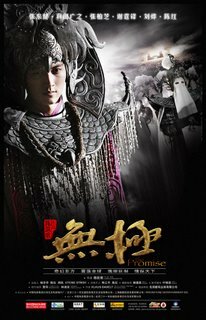 Being hyped as the 'Lord of the Rings' in the east, this film is currently the most expensive Chinese film ever made. And it made me wonder where did the money go to? The props? The decoration? The set designs? The cast salary? Or... the god-awful special effects? The god-awful special effects deserve a mention, because it almost ruined the entire viewing experience for me. And that's a bad thing for a film that's supposed to be a visual spectacle. At the beginning of the film, there was a raging stampede of bulls and barbarian slave Kunlun (Jang Dong Gun) trying to outrun them, the scene was like the Brontosaurus stampede in King Kong again, but without the thrills and realism (many complained that the sfx in that particular scene was bad... wait til you see The Promise). "That's soooooo obviously CG!" Said my sister, who was sitting next to me. And of course, she was right. 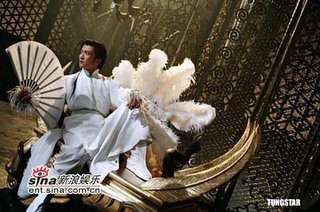 Perhaps it would be unfair to compare The Promise with King Kong, but Chen Kaige should've understood the limitations of his own SFX team (I think it's a HK-based), and attempt to rely less on the special effects, which looked even less impressive than some generic PS2 game I bought. That's because the most interesting parts of the film were when everything slowed down and the plot kicked in. Kunlun (a mandarin-speaking Jang Dong Gun) the primitive becoming the slave of the ruthless General Guang Ming (a mandarin-speaking Hiroyuki Sanada) after aiding the latter in winning an important battle. 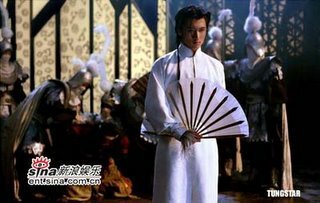 But pretty boy Wuhuan (Nicholas Tse) had invaded the capital because he wanted the King's concubine, QingCheng (a dubbed Cecilia Cheung) for himself and General Guang Ming was called back to protect the king. Unfortunately, he was wounded by Wuhuan's assassin Snow Wolf (Golden Horse winner Liu Ye), and had to send Kunlun in his stead. The poor slave ended up disguising as the general and made his way to the capital. Some confusion occurred (the King turned against QingCheng), and Kunlun killed the king, rescuing the damsel in distress. 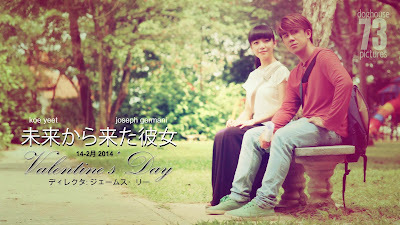 He fell in love with her, but she thought he was General Guang Ming. A convoluted love triangle occurred. Oh, and Nicholas Tse continued being a badass. What made Lord of the Rings successful was the fact that the characters were realistic enough for viewers to invest upon emotionally, and the Middle-Earth, despite being a purely fantasy setting, was infused with so much life and realism that one would find it difficult to see such a place being destroyed by evil forces. In The Promise, the fantasy settings were mere props, so that certain fantastic elements could be inserted within the film (ah, Kunlun running so fast that he could time-travel) without having people laugh at for being too silly. Some sceneries were beautiful, but other than that, the world was so simplistic and shallow that one wouldn't really immerse themselves within the movie, especially when the protagonists were so shallow, forgettable, cartoonish and difficult to relate with. A plausible culture and politics were entirely absent in the settings of the film, After all, the best fantasy stories, besides having interesting settings, must have characters who can serve as the eyes of the viewers. A hint of normalcy. What made Harry Potter so popular? Harry himself was easy for children to identify with. What made Lord of the Rings so great? It was the extensive work Tolkien had done in the world-building, the characters may not be much (in the books), but Middle-Earth seemed real. And Narnia? Despite a fantasy world, the four protagonists were normal people with normal problems, so they may be thrust into extraordinary circumstances, but it was easy for readers to feel what the Pevensie children felt in the story. 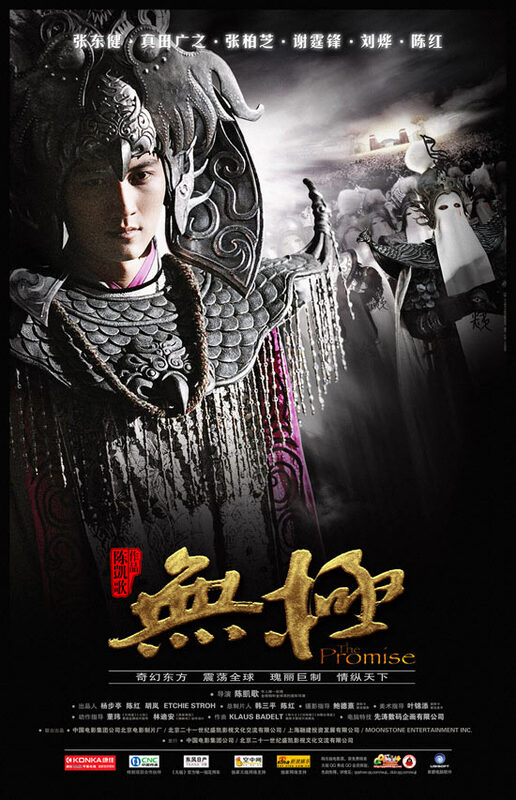 Once again, the world in the Promise wasn't something Chen Kaige wanted us to explore, he didn't bother developing any mythology or backstory for it (the Russian film, Night Watch, did much better in this area), and the characters were just too abnormal and unsympathetic for any emotional investment. Thus the hollowness of the film. Now, don't get me wrong, this film is far from being a pure stinker, it had its entertaining parts, and some actions scenes did thrill, some sentimental scenes were MILDLY moving, but it could've been so much more. For a film of such a collossal budget, I had wanted to see a grander storyline, not just some B-movie featuring four people backstabbing and feuding against one another with some mundane fighting scenes (you won't remember any fights in here like you did with Hero, or Crouching Tiger Hidden Dragon, hell, even the stinker House of Flying Daggers had more memorable action scenes). I could launch into the technical aspects of the film, voicing out what I think about the acting, but there is nothing remarkable about the cast except for Nicholas Tse's standout performance (Liu Ye was decent too). Therefore, I dare not imagine what the film would be like without him. I think it's time for Nicholas Tse to rebuild his career.